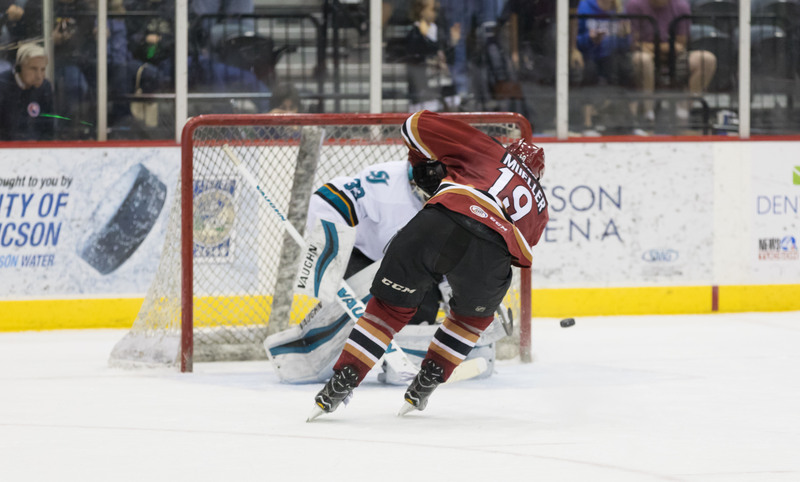 The Roadrunners edged their way to a victory over the San Jose Barracuda Sunday evening – their first win against their Pacific Division counterpart this season, 5-4 in a shootout at Tucson Arena. The win was the first for the club in six games. Following a scoreless first period, the Roadrunners’ offense erupted for four goals in an eight-minute span to build a commanding 4-0 lead. Michael Bunting buried the team’s first goal of the night just under four minutes into the second period when he chipped home a shot past San Jose’s Mantas Armalis from the right side of the crease, scoring his 12th goal of the campaign. Just over a minute later, Chris Mueller finished the work on a scrum in front of the Barracuda net, sliding home a loose puck for his 14th goal of the season. At the midway point of the second, Brandon Burlon corralled a puck won off of an offensive zone faceoff and fired a shot that found its way through traffic and past Armalis to give the Roadrunners a 3-0 lead. For Burlon, it was his third goal of the year. Moments later, Branden Troock fled through the neutral zone and into San Jose territory, eventually beating Armalis with a wrist shot that squeezed its way through the netminder’s pads. The Barracuda registered their first goal of the game in the final moments of the second period. San Jose registered three goals in the third period, including the game-tying marker with 50 seconds left in regulation. Neither team scored in overtime; Marek Langhamer stood strong as the Barracuda outshot the Roadrunners by a 7-1 count. Conor Garland scored for the Roadrunners in the first round of the shootout, beating Mantas Armalis through the five-hole. Chris Mueller scored in the third round, clinching a Roadrunners win, beating Armalis with a shot off the post and in. Marek Langhamer stopped both shots faced in the shootout, and made a combined 39 saves during regulation and overtime. The Roadrunners are now a perfect 3-0 in shootouts this season. 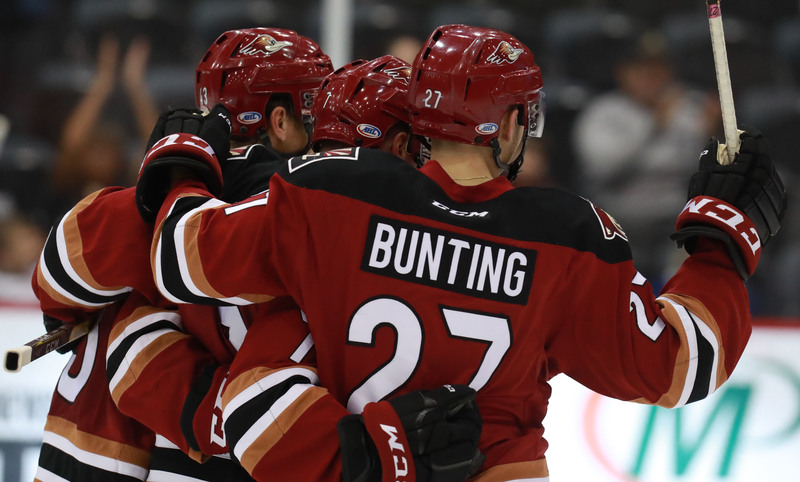 The team will continue its five-game home stand Tuesday night when they host the San Antonio Rampage at Tucson Arena, where the puck is scheduled to drop just after 7:05 PM.